Go north on Co. Rd. 550, which is Sugar Loaf Ave., from Wright St. in Marquette and go about 22 miles to Co. Rd. 510. Turn left onto Co. Rd. 510 and go about 6.3 miles to the yellow Dog River. Cross the river and park on the left. Follow the trail downstream, on the right bank, for about 1 mile to the falls. The trail is fairly easy to follow. The directions in the Michigan Waterfall book indicate the trail is about 1.5 miles and is difficult to follow. However, I received directions from a Big Bay resident saying it was less than 1 mile and very easy to get to by these directions. These are the second set of directions given in the Michigan Waterfall book. The directions I followed are those given me by a local resident. However, when I found the falls, it was clear they were not the same falls as those in the Michigan Waterfall book for Bushy Creek falls. The authors took the other set of directions. I then took that set of directions, which included going down a very, very steep hill (I hesitated to go down it, but finally did) and came to the falls that are pictured in the book. So I'm not sure which are the actual Bushy Creek Falls - those I found by following local resident's directions, or those by following the directions in the book. If anyone knows which are Bushy Creek Falls, and the name of the other falls, please let me know. This is the second falls I found, which looked like the falls in the Michigan Waterfalls book. According to Michigan Waterfalls by Penrose, Bushy Creek Falls is also known as Yellow Dog Falls and Yellow Dog Slate Falls. 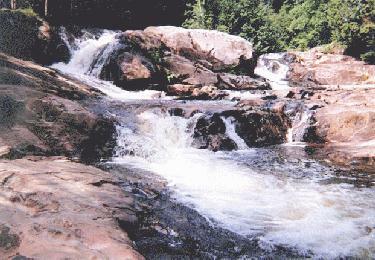 According to the Marquette County brochure "Your Guide to Marquette County Lighthouses and Waterfalls" Yellow Dog Falls is also known as Hills Falls. 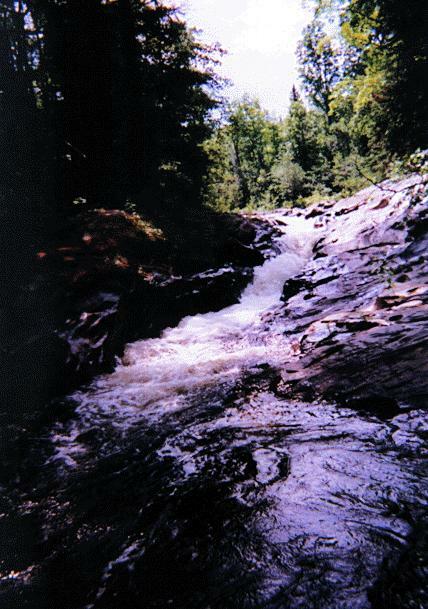 I believe I got the name Hills Falls from a waterfall safari I took back in about 1989, because most of the waterfalls I found in the UP I've found by using Penroses' book Michigan Waterfalls, and there is no Hills Falls there. So I believe the guide on the tour used Hills Falls, so that's what I called it. Then I used Penroses' book to find Bushy Creek (or Brushy Creek). From Marquette - Travel County Road 550 north toward Big Bay, approximately 23 miles to County Road 510. Turn left (west) on County Road 510. Travel about 7 miles to the steel bridge across the Yellow Dog River. Park here on the left (south) side of the road. Follow the hiking trail on the south side of the river approximately 1/2 mile downstream. This is a nice walking trail with few ground obstacles. You will approach the falls from the top. (Note: View Big Pup Falls next). "According to your website, there is a descrepency between a Michigan Book of Waterfalls direction to Bushy Creek and a resident's direction. It appears that your first picture is really Yellow Dog (Yellow Hills) Falls and the second picture is Bushy Creek. I haven't been to Bushy Creek, but I just went to Yellow Dog Falls and the directions are almost identical to your first directions. I received my directions from Your Guide to Marquette County Lighthouses and Waterfalls. I hope this is helpful. Heather Klingelsmith Marquette Resident"
"I just wanted to give you a little added info on the Yellow Dog Falls. I think the name of the large falls on the Yellow Dog are the Yellow Dog Falls, the Brushy Creek Falls are down stream from the larger falls and are a small series of falls that form where the Brushy Creek flows into the Yellow Dog River. The name of the creek is the Brushy not the Bushy from all the maps that I have looked at. B. A. Reimer"